Knightrider had an episode where David Hasselhoff is playing pacman against Kitt. I'm not sure if this has been mentioned not having the time to trawl through 16 pages but there's a Queen video of a lesser known song and it's set in a boys bedroom and he has lots of Ocean/Imahgine posters on his wall and games by the same on his shelf! The kid in Quarantine 2 plays on a PSP Go briefly, I think the game is Modnation Racers. An episode of Veronica Mars has two characters playing Mario Kart: Double Dash on the Cube. Resurrecting this cab in the hope someone can name the game/cabinet or put to rest that it was just a home computer game in a prop cabinet. mlucifersam wrote: I'm not sure if this has been mentioned not having the time to trawl through 16 pages but there's a Queen video of a lesser known song and it's set in a boys bedroom and he has lots of Ocean/Imahgine posters on his wall and games by the same on his shelf! The video was 'Invisible Man' and it is chock full of gamey goodness to spot. In Attack the Block, they constantly refer to videogames like gears of war and Fifa. Sounds more like product placement than a reference though. I don't know why any brand would want to associate itself with that movie, but who knows. Never noticed this before, but in the video for Cornershop's Brimful of Asha, there's a Computer Space cabinet in the background. The (original) karate kid - his girlfriend plays on a Pac man cab, with Galaga and many others in the background. Sign outside the building says something like "arcade. Lots of new videos"
just channel hopping now, theres a psone in everyone loves raymond. i don't know if its a main character or anything because i don't watch the show. Probably already mentioned. But I recently went on a bit of a binge of z-grade 80's horror and sci-fi movies that are all on Youtube - Class of 1999, Chopping Mall etc. I also gave Night of the Comet a watch, was surprised to see whatserface who was also in The Last Starfighter playing Tempest (possibly my favorite of Atari's old vector games) in the lobby of the cinema at the start of the flick. The Tron arcade machine features in... er... Tron Legacy, funnily enough. A Frogger machine appeared in an episode of Seinfeld, and a (fictional) Doom 2 arcade machine also appeared on the show. I believe it was the same one that was in Grosse Point Blank. 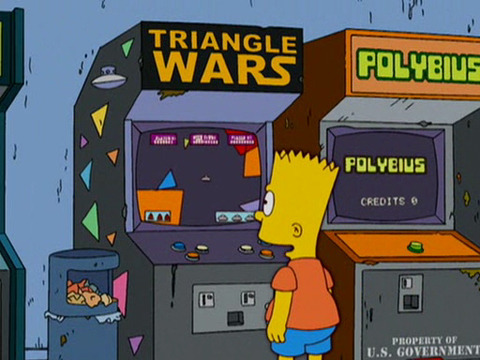 Polybius appears in an episode of The Simpsons. In a couple of seasons of Fresh Prince of Bel Air, there would always be a NES sitting on top of the TV. Also a few episodes they played but, but you could never tell what game they were playing. He also plays the game himself in the next episode. Gibberish Driftwood wrote: Knightrider had an episode where David Hasselhoff is playing pacman against Kitt.